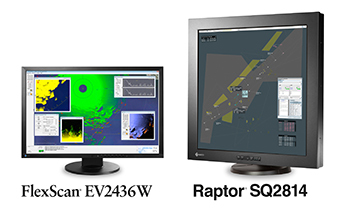 Wolfrathausen, Germany, September 17, 2015 – EIZO today announced that the Aeronautical Radio of Thailand Limited (AEROTHAI) has deployed EIZO air traffic control (ATC) visual display solutions in their ATC centers throughout the Kingdom of Thailand. To maintain the high level of professional air traffic control and aeronautical communication services while addressing an increase in air traffic volume, AEROTHAI has renewed and increased their overall capacity. They enlisted the SAMART Group to implement the air traffic management (ATM) system which includes over 450 EIZO monitors and recording & streaming solutions. “EIZO’s comprehensive range of products allowed us to quickly deliver highly reliable solutions to AEROTHAI, streamlining the entire installation. Their ability to customize their products and their level of support throughout the process has proven that EIZO was the optimal choice for the project,” comments Mr. Paisarn Navanimitkul, general manager at SAMART. The EIZO products now installed at AEROTHAI include the Raptor SQ2814 2K × 2K primary control monitor, FlexScan EV2436W auxiliary monitor, and a Re/Vue recording and streaming solution – forming a complete visual display solution for AEROTHAI’s controllers. The solution provides exceptional image quality for displaying high-resolution ATM applications and auxiliary information, and image accuracy with industry-leading lossless compression ratios in recording & streaming. It also meets the high reliability requirements demanded in ATC environments with products that are developed and manufactured in-house by EIZO. EIZO (TSE:6737), which means image in Japanese, is a visual technology company that develops and manufactures high-end display solutions. EIZO integrates hardware and software technologies with consulting, web hosting, and other services to help customers in business, graphics, gaming, medicine, maritime, air traffic control, and other fields work more comfortably, efficiently, and creatively. Headquartered in Hakusan, Japan, EIZO has R&D and manufacturing facilities in Japan, China, Germany, and the US.